I train because I love the fact that martial arts is a continuous learning process. There is no end and you can always learn something new. A couple of the added benefits are being able to defend yourself, obviously, increased body awareness and it definitely keeps you in shape! When I learn anything in my martial arts training it is fulfilling and rewarding to be able to pass that knowledge on to people who are just starting out. Martial arts is unique in that even those who have not practiced nearly as long as you have can still teach you something in your journey as well. Learning and teaching sometimes because interchangeable and I love that about all the arts. 6. What Is Your Single Most Defining Factor In Training? 7. What Was Your Biggest Hurdle In Martial Arts? And How Did You Get Over It? I get frustrated sometimes when I can’t get a new move or can’t understand a new concept. In these times I have to force myself to slow down and just continue to practice until I get it. I ask my classmates or instructors to help me whenever they can and then just do the move over and over. 8. Whats On Your Play List In Class? Justin Timberlake, Rhianna, Michael Jackson, Jay-Z, Calvin Harris, DMX, Beyonce and so many others. It depends on the day and my mood! 9. What Class(es) Do You Teach? And Which Do You Train? I train Muay Thai, Jeet Kune Do and Brazilian Jiu Jitsu. I teach some of the Muay Thai, weapons and Jeet Kune Do classes. 10. One Go To Move? I don’t have one style as my go to so I can’t answer that, I love them all. But my go to move in Muay Thai is definitely the flying cross. But don’t tell my opponents! 11. How Do You Get Your Training In, Even On The Busiest Week? There is always a way to get training in whether its shadow boxing at home before bed, going to class or practicing a move in the park, there are no excuses because even 10 minutes is better than nothing. 12. How Has Martial Arts Transformed Your Body, Your Health, Your Mind, Your Ability, Your Confidence? 13. Why Should I Try Your Class? I always give an intense class, whether it’s physically or mentally, but you’ll always walk out of class knowing something new you didn’t know an hour earlier…. Where can you find J&eacute;nel? 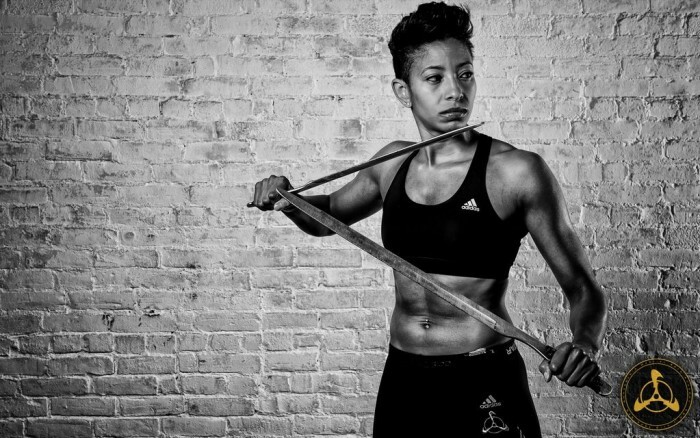 On the Anderson’s NYC training floor of course – she trains at the Academy daily taking Boxing, Muay Thai, Jeet Kune Do, Kali and Brazilian Jiu Jitsu. Jenel also teaches some of our Muay Thai, Jeet Kune Do, and KB classes. —> email us at webinfo@andersonsmartialarts.com to try a class!